Flareon is the fire Eevee... also known as... the Flame Pokémon. I personally feel that Flareon was the left out child in the original 3 Eeveelutions. Sad. Well let’s make him popular today. First! GRAB A FIRE STONE! Done. Now that you have your hot-hot-hot Flareon, let’s make him (or her) more awesome. Before we start, I want to point that that Flareon is the only evolved Fire-type that cannot learn Solarbeam. Lame. So anyways, off topic much, I know. Flareon heats it up in Attack and Special Defense. 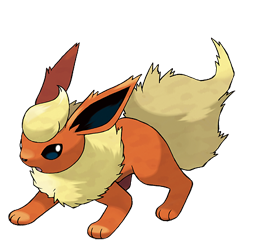 You can make Flareon a baton passer like Vaporeon, but today we are going to make Flareon attack heavy like Jolteon. For those of you about to complain and want defense, look into these moves: Baton Pass, Wish, Protect, Toxic, and Scary Face. Let’s look at some awesome attack move. First off, Sunny Day is always a good way to improve your Fire attacks, but then you can follow that up with moves like Overheat, Flamethrower, and Lava Plume. Lava Plume is great because it has a base power of 80, and it will attack all Pokémon on the field, with a 30% chance to burn. Now, those are all fire-type moves, but we could mix it up with Bite, Last Resort, Giga Impact, and Shadow Ball. Superpower is also a great move to throw on your Flareon, you can pull off 120 damage fighting move, so look into that. Overall, the first three Eeveelutions keep things simple, but they are quite awesome. The question stands... does Flareon burn with you? Let’s see what Eeveelution is the most popular, use your Facebook likes to like the ones you would use, at the end of next week, let’s see what Eeveelution stands out!